The North Carolina State graduate primarily worked with the pitchers but was involved in all aspects of the program, which finished the 2018 season 39-17 overall and 22-6 in the league, won regular season and tournament titles and went to the NCAA tournament. 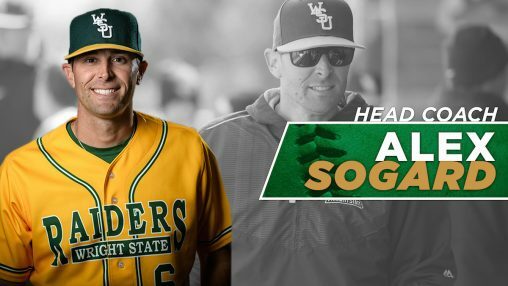 Sogard was also instrumental in helping Wright State to its first-ever top 100 recruiting class (87th) in 2018. In Sogard’s first season on Wright State’s staff in 2017, the Raiders reached new heights, receiving its first-ever top 25 ranking and finishing the season 38-21 over and 21-9 in the Horizon League. The Raider pitching staff compiled a 3.70 ERA and broke the all-time program single-season strikeout record with 423. Sogard was drafted by the Houston Astros in the 26th round of the 2010 MLB draft and played seven seasons of professional baseball. In his first full season with the Astros organization, he led the Single A Lexington Legends in strikeouts. He advanced as high as AAA and was selected to play in the Arizona Fall League in 2012 with the Mesa Solar Sox and 2013 with the Peoria Javelinas. He also played in the Arizona Diamondbacks and Baltimore Orioles organizations. Sogard worked as the pitching instructor for several elite camps, including the Pro 5 Academy in Raleigh, North Carolina.